Inside Crochet magazine has just gone monthly which means two things, firstly I'll have to try and wait to do my magazine reviews until I have the two latest issues (otherwise I'll just end up every two weeks with just magazine reviews and no book reviews). Secondly I'm going to need to get it renewed again at Christmas time as what I thought was a year's subscription now will disappear after 6 months! This September issue was the first of my new subscription to Inside Crochet and so also came with some lovely white merino lace weight yarn that I can't wait to have a go with. The only problem is that I only got 50 grams of it and trying to find a pattern that will use that quanity is going to be tricky. Hopefully you'll be seeing the start of a project with it soon. Now on to the contents of issue 9! The new monthly Inside Crochet has a new editor and for this 're-launch' issue she has found some new contributors which is a bit of a relief as we were starting to just get patterns and articles from the same people each time. There are some lovely patterns in this month's issue that really appeal to me, especially the beautiful baby dress that I just got on my hook yesterday and I'm alreadly loving how it is shaping up. There is also a feature on working hairpin lace with a couple of lovely patterns designed for that technique. My other favourites include a very cute mushroom shaped pouch that I'm tempted to have a play with for a mystery project of my own, a mesh tank dress and the very beautiful flower square blanket made up using sock yarn in blues and silver. 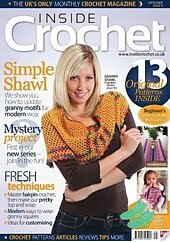 The new magazine format includes crochet news with details of UK based crochet events, an array of lovely crochet related buyables, and a number of book reviews (the September issue also did a review of "Tasty Crochet" - obviously a popular book this month! ), photos from reader projects, yarn reviews and a feature on a crochet related website. There was also a great article on crochet in fashion this month with some really fantastic photos from the graduate fashion week which was very inspiring. So all in all a great new issue - I hope the new editing team continue to deliver! This month didn't seem to do so well for patterns, most of them I'm not even slightly tempted to make though there are a couple that redeem the issue for me, the lovely little kingfisher amigurumi designed by June Gilbank (I love her designs - the pigs I made recently were also by her), the Damson tunic looks lovely, the petal beret is very pretty and I like the stitch pattern for the Ammonite scarf. 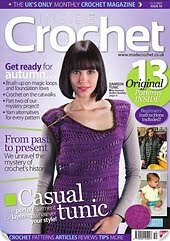 The articles in this issue are what made it worth reading for me as there was another great piece about crochet in fashion with some more great photos of crochet designs on the catwalk. 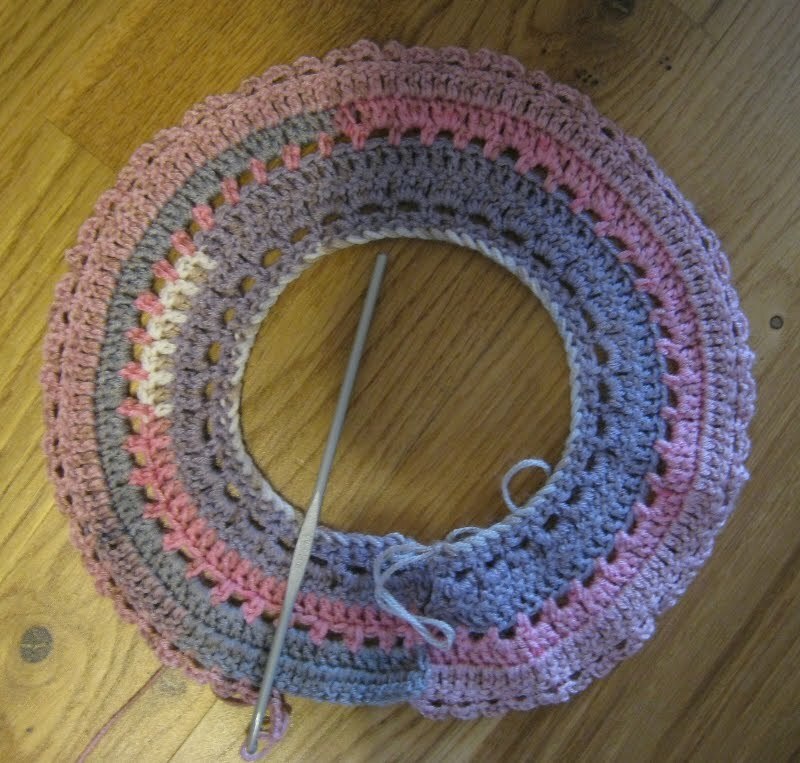 The article about the history of crochet was also very interesting, it spoke about the mystery over when crochet first started and where as well as about the highs and lows for crochet over the years.